A green reptile found in my son’s pocket? Is that a new hunting event for an evening meal of frog’s legs? Frog or Frogging is a friendly term for ripping out needle work. “rip-it rip-it rip-it” as in “ribbit ribbit ribbit”. Cute right! How many times have you started a new pattern and before you get the first row done it just does not look right? I read the written instructions, I have stared at the graph of the pattern AND I even watched the tutorial! Frog it! Do it again … half way through the row … it still does not look right … Frog it! Okay, one more time and then I give up! Darn it, what am I doing wrong!?! This time I am taking a picture and gunna show my crochet friends and see if they can tell me what I am doing wrong! Snap. Post. Wait … wait … wait … The majority of what everyone says to do is to just keep going, don’t worry about what it looks like right now. But how can I keep going if it is not right? Sometimes we Frog our crochet projects too prematurely and don’t give the pattern a chance to look right. 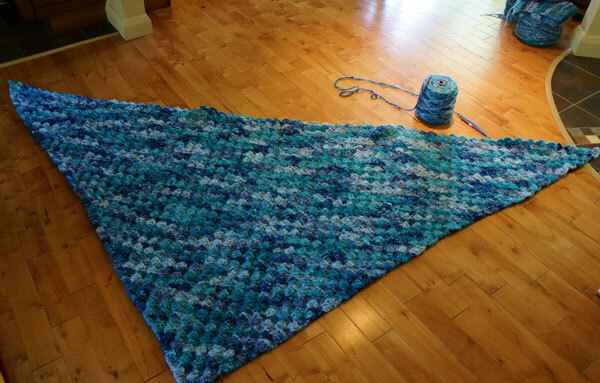 The Ocean Waves Afghan featured on The Crochet Crowd was one of those projects where nearly 4 rows needed to be completed before you could really get an idea on what was happening in the pattern. So here I go, I finish row one, start row two. It still doesn’t really look right. Keep going! Row three looks better but it is still not really coming together! I want to just give up. I am doing something wrong I just know it. I can’t do this pattern, I am not good enough! It’s too hard! OK, row four … hey look … now that looks like the pattern … Wow ! Sometimes we have to stop listening to that little voice in the back of our minds that says those mean ugly things to us. Keep going and save the Frog for a skipped stitch or an extra stitch. This has happened to me each and every time I start a project that is completely new to me. I have wasted an entire day on row one. I have given up and never tried that pattern again. I lost out on a beautiful item to use, gift or sell. I lost the enjoyment and fulfillment of accomplishing something new. I have an idea! Each time I am going to start a new project, I am going to make a swatch, a practice square, in cotton yarn. It is a small repetition of the pattern and in the end will become a dishcloth or washcloth to use or gift. I will perfect the stitches and not have to frog as much with less of my time being wasted. Next time you are in the beginning… don’t be so quick to Frog, you might be ‘leaping’ backwards when you should try to keep going and let the project work itself out. This entry was posted in Advice & Tips and tagged Advice, Craft, Crochet, crochet crowd, Frog, Frog's Point of View, Frogging, Hoppy Stitches, LOL, Pattern, Patterns, Tammy Cologie, The Crochet Crowd, Tips, Yarn. Bookmark the permalink. Should I tell you this? Ok here it goes… I once crocheted a blanket that was so long I was running out of yarn and went to buy more… My sister in law came over and for some odd reason we layed the blanket out on the floor. It was so long that it covered all of the width and half the length of my livingroom floor roflmao! I frogged a pattern from Ravelry three times before I gave up and did my own stitch. They turned out just fine, maybe better. That pattern was written very badly, imo and two others said the same. I’ll try not to “frog it” so much. You are an inspiration to me. I’d like to thank your mom for raising a wonderful son! P:S: Humidity here must be what it’s like in the Amazon jungle. Great advice on not frogging too soon, Tammy… and April- what a great idea! That Ocean Waves pattern did me in but I’d still like to figure it out. Making a whole afghan was too intimidating, but I’d love a tote bag!! Great idea! What a great post! I will frog if needed, but did something similar on the Ocean Waves pattern. The first (and only) time I made a ripple afghan, I ended up frogging so much I probably did the afghan twice over, and it still didn’t turn out right. It was a brutal experience and I was terrified of doing another ripple. But, I finally decided I was going to learn how to do it so I could do Ocean Waves. I made *three* practice swatches before I felt confident enough to take on the real afghan. I’m about 12 rows in on a queen size version. I admit I have had to do some frogging, but overall it is going really well and looking soooo pretty! love the idea of doing a cotton swatch that can be later used for washcloth, potholder, etc. I have never been one to make a swatch. It reminds me of all of the pre writes teachers always want when you were in school. I edit as I write, so I edit while I crochet. I am working an on baby blanket right now. I didn’t like the way the middle stitch pattern was working out. I frogged it and am using a different stitch for the middle section. I hope it turns out okay. I have had to frog a whole poncho because after it was done I hated it!!! LOL Reclaiming the yarn was a witch job too! I made a swatch with the Ocean Waves pattern. I just couldn’t stop! It turned out to be a tote bag with flap closure. Pretty cute!